Figure 1. Runner removal in the fall is recommended. Avoid removing runners until about three to four weeks following transplant. Complete a follow-up runner removal operation at six weeks following transplant if necessary. Plug transplants that are established in September are particularly susceptible to a fall runnering problem. There is generally less problem with fresh dug plants than plugs. Plant canopy and runners. Plants should have three or more fully green leaves remaining at the end of the initial three- to four-week establishment period, regardless of whether they are fresh dugs or plugs. If the “original” leaves on a fresh dug or plug are lost to drought stress, plant establishment will be significantly delayed or “set back” and spring yields will be significantly reduced. The number of leaves and total plant leaf area in the late fall/early winter can be correlated with fruit production the following spring. Runners that develop in the fall can be removed to prevent competition with branch crown formation and overall growth of the main plant that was transplanted in September/October (Figure 1). It is also very important to achieve an adequate plant canopy by late fall as a good leaf canopy acts as an important crown insulator and is the “cheapest” winter protection you can buy. A 6- to 7-inch plant diameter is ideal in mid-December; you do not want the plants to be touching in the row in December as shown in Figure 2. Plants that are 6- to 7-inches in diameter and have at least one new branch crown or “side stem” by mid- to late-December will be on track for producing a good crop (Figure 3). In general, it is desirable to produce a plant with four to five branch crowns by early spring for optimum yield and berry size. Crowns. 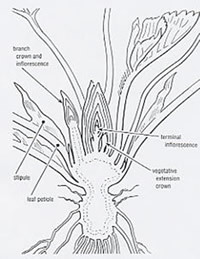 Branch crowns and main crowns are structurally identical, and a flower structure called an inflorescence develops at the terminal growing point of each crown (Figure 4). Figure 2. These plants were spaced at 12 inches and were nearly touching in the row just 9 weeks after planting. Excess plant size is generally associated with an early planting date, and can lead to significantly reduced fruit size in the spring when these plants will potentially have 8 to 10 branch crowns per plant. Crown and branch crown growth and development occur when temperatures are above 50oF in October and early November. Average daily temperature in mid- to late-November below 50oF will slow branch crown formation and floral development. Row covers may be a good option in mid-November for Camarosa to help stimulate further reproductive development, especially in the Piedmont. 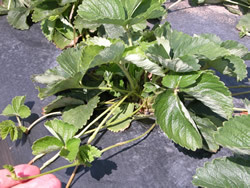 A well-balanced Camarosa strawberry plant will form four to five branch crowns by the time fruiting season begins in the spring while the slightly more vigorous Chandler variety will develop around five to six branch crowns under the same growing conditions. With both Chandler and Camarosa it is critical to refrain from planting too early in the fall and run the risk of having too many crowns form. It is important to avoid the development of more than six crowns per plant. 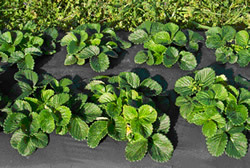 There is a critical balance to keep in mind when growing strawberries on plastic. The plants must get enough growth for adequate cropping (a minimum of four crowns per plant), but not so much growth (more than six crowns) that fruit size may decrease and become a marketing problem. Significant fruit size reduction occurs on plants with eight to 10 crowns. Figure 3. The “growing point” of the strawberry is in the center. Note the formation of a new side stem, or branch crown, that has begun to form in late December. There is excellent potential for a yield in excess of 2 lbs. per plant (> 15 tons per acre) when you can see the formation of 1 to 2 side crowns in addition to the main crown (center) in late fall/early winter. Roots. Rooting is active throughout the fall and early winter as long as soil temperature is above 45oF and roots remain healthy. It is important in the fall season to maintain adequate moisture in the beds for active root development. To aid transplant establishment in October and November, it may be necessary to run the drip system for a few hours every few days during weeks of little or no rainfall. Fruit quality and flavor will be negatively influenced by extra thick plant canopies – if the leaves nearest the berries are well-exposed to light (not shaded by other leaves), you can anticipate higher fruit sugars and more favorable remarks from your customers. If beds were prepared as described under Pre-planting, no fertilizer should be needed after transplanting. It takes strawberry plants (especially fresh dugs) two to three weeks to establish a new root system, and you should not expect the plant’s top-growth to look that healthy and vigorous during this initial period. Thus, growers should not be alarmed if fresh dugs do not appear to have adequate nitrogen in the first two to three weeks following transplanting – it takes this much time for the plants to establish a new root system that is able to take-up the nitrogen, phosphate and potassium fertilizers that were applied prior to bedding. After three weeks, you should see the plants “color up” and begin to produce healthy new leaves. If pre-plant fertilizers were not applied, then it will be necessary to begin a fertigation program starting in the third week following transplanting. However, pre-plant fertility should never be omitted in favor of a drip fertigation program. Fig. 4. Branch crowns and main crowns are structurally identical. A flower structure called an inflorescence develops at the terminal growing point of each crown. 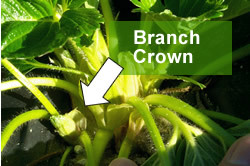 This diagram illustrates the structure of a strawberry plant in North Carolina in late fall with a single branch crown. Source: Integrated Pest Management for Strawberries, Publication 3351, Univ. Calif., 1994. Plants should have three or more fully green leaves remaining at the end of the initial three- to four-week establishment period, regardless of whether they are fresh dugs or plugs. If the original leaves on a fresh dug or plug are lost to drought stress, plant establishment will be significantly delayed and spring yields will be significantly reduced. The number of leaves and total plant leaf area in the late fall and early winter can be correlated with fruit production the following spring. Avoid removing runners until about three to four weeks following transplanting. Complete a follow-up runner removal operation at six weeks following transplanting if necessary. It is also very important to achieve an adequate plant canopy by early winter as a good leaf canopy acts as an important crown insulator in winter. An 8-inch plant diameter is ideal in mid-December. For good berry production, each plant should form one or two side stems (the branch crowns) and eight to 10 leaves by mid-December. Wildlife. Electric fences should be put up no later than the third or fourth week in October to protect succulent new strawberry plants from deer. Yield loss associated with deer depredation can be 50 percent or more in unprotected fields. Anthracnose. If anthracnose is positively identified in newly established plants, apply a strobulurin (such as Quadris or Cabrio), before colder temperatures in late fall to protect the plants from colonization. This treatment can potentially prevent the establishment of an epidemic in anthracnose susceptible varieties including Chandler and Camarosa. Inject mefenoxam (Ridomil Gold) EC through the drip system a week before planting. Make foliar applications of a phosphite-based product (Phostrol, Prophyt, Agri-fos) two to three weeks following planting. Mites. A miticide application may be needed in the early fall to prevent two-spotted spider mites from reaching damaging levels in the late winter. Check plugs carefully for mites three to four weeks after transplanting. Make the miticide application before the late fall or early winter application of row covers if row covers are being used for winter protection. Botrytis crown rot. This disease becomes a concern in unusually warm falls when there can be significant blooming. Botrytis crown rot colonizes the dead flower tissues and moves into the crown. Rovral is an effective treatment option if Botrytis occurs.